Leptin antibody LS-C344872 is an unconjugated mouse monoclonal antibody to rat Leptin. Validated for ELISA and WB. Leptin antibody was raised against recombinant rat leptin. Recognizes rat leptin. Detects a band of ~16kDa by Western blot. Does not cross-react with human or mouse leptin. ELISA - Direct or indirect: 1:5000-1:10000. Western blot - 1:2000-1:10000 using ECL. PBS, pH 7.4, no preservatives. 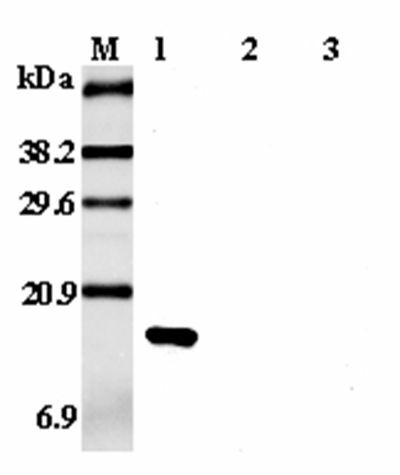 Western Blot analysis using anti-Leptin (rat), mAb (RLEP 227) at 1:5000 dilution. 1: Recombinant rat leptin. 2: Recombinant mouse leptin. 3: Recombinant human leptin.